Buy your load for as low as P10.00, anywhere! New Talk N Text Ticket Load. This is very useful when you are traveling. Buy ticket load and you can use it during your emergency. It can be use either for texts or calls. 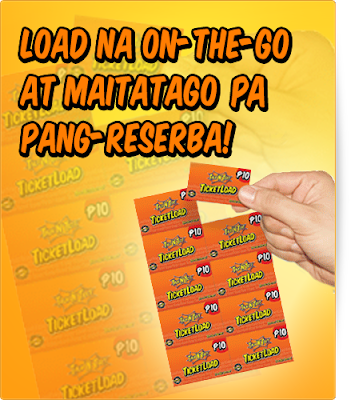 TNT TicketLoad is available in Talk N Text stores/dealers or in selected nearest stores near you. Scratch off the protective ink at the back of the card to reveal the 14-digit PIN or the personal identification number. For Talk N text, dial 1511 + 14 digit PIN and send. When your traveling and you run out of load, no load stores to be seen, be always ready. Bring TNT TicketLoad in your pocket anytime, anywhere! Remember, wise people are those who are always prepared. whats the deal. .nag dial sa 1511 na yan at sinasabing your call was invalid. .tas mag didisconnect agad. ilang beses ko ginagawa mag dial at paulit ulit din nangyayari.